The first minutes make clear why it’s called “Breath” – because this is what you inevitably have to hold, and several times, during this performance. 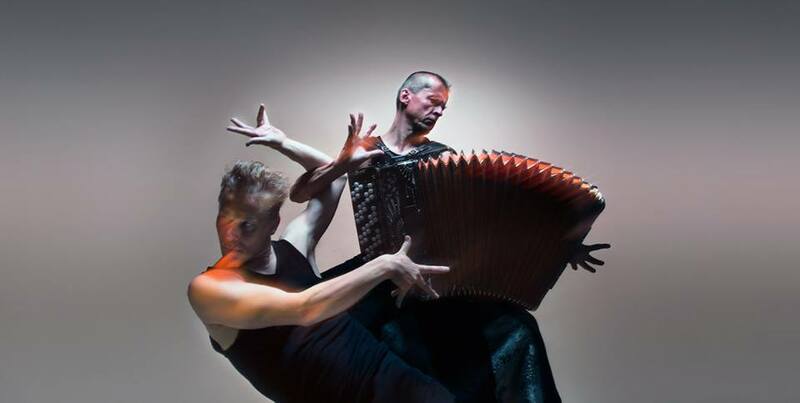 Which should not be a surprise when two internationally appreciated Finnish artists unite: Dancer and choreographer Tero Saarinen and “that wild accordion slinger” Kimmo Pohjonen. The latter appears several times on this website, e.g. in this interview (or watch the DVD “Soundbreaker”). What unites both is besides their nationality their reputation as being unique and ingenious in their art form. What follows is difficult to describe, in words only … it’s a breath-taking (sic!) assault on almost all your senses, lights, music and dance – the clip below might give you an impression. Some scenes are hilariously absurd, or funny (one I interpret as parody of Martial Arts duel computer games) – there’s virtuosity as well as vulnerability in this spectrum of expressions. Kimmo and Tero act as opponents, partners, shadowing each other – and I assume that Tero adapted not just his hair style but also his body language towards his counterpart. Otherwise the physical likeness would be way too disturbing … I also have to mention the physical challenge for Kimmo, playing his heavy instrument live almost throughout his dance performance …. When both seem to merge into one persona – this is the moment you’ll be breathless. A great performance project – and all people involved deserve praise (see list below). Is this the first time Kimmo and Tero have been working together? High time that it happened, and hopefully it is not the last time. I can only recommend to go and watch “Breath” as soon as you get a chance.